SAFE Committee member and Senior Lab Instructor Cindy Murphy standing by a display she and Tareq Hadhad from Hadhad Chocolates set up a to promote StFX for SAFE at the StFXAUT AGM on Wednesday, May 4. 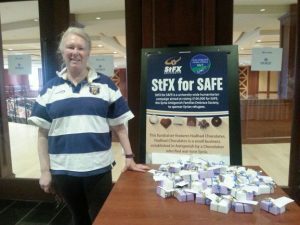 StFX for SAFE raised $395.00 at the AGM through Hadhad Chocolate sales (nicely packaged for the upcoming Mother’s Day celebrations). This initiative was undertaken for the 2016 StFX Farewell Graduate Convocation event on April 30th where $650 was raised and nicely continued through to the AUT general meeting. To donate to the StFX for SAFE effort, you may either send an e-transfer from your online banking site to safamiliesembrace@gmail.com or send a cheque made out to StFX for SAFE, 204 Kirk Place, 219 Main Street, Antigonish, NS B2G 2C1. Please note that donations are tax deductible and a 2016 receipt will be issued. 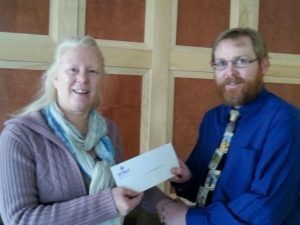 On March 22, StFXAUT Executive Committee member Kris Hunter presented a cheque to SAFE committee member and Senior Lab Instructor, Cindy Murphy, for $1,740, the second installment of the StFXAUT’s $3,480 donation. This entry was posted in News and tagged aut, donation, meeting, safe, stfx, stfxaut, syria. Bookmark the permalink. Both comments and trackbacks are currently closed.